This will broadly cover the fields of “Food Science & Technology” as well as for initiation of new prospects and to explore new tendencies in the field of “Food Technology & Nutritional Science”. This includes keynote presentations, Oral talks, Poster presentations, Video presentation, and Exhibitions. 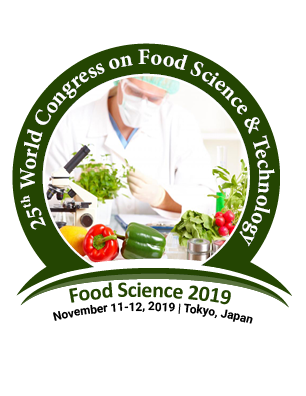 Food Conferences is overwhelmed to announce the commencement of “25th World Congress on Food Science & Technology " which is going to be held on November 11-12, 2019 Tokyo, Japan. The conference highlights the theme “Investigation & Improvement in Food & Nutritional Science” aimed to provide an opportunity for the professionals to discuss the technological advancements in the field of Food processing and technology. Food Science Congress is designed to provide a platform for Food Technologist, Microbiologist, Food safety officers, Nutritionists, Dietician, Quality control officers, Quality assurance officers, Scientists, Researchers, Biotechnologists, Industrialists, Food Engineers, and Food Professional from Manufacturing, Retail, and Food Service Industry. Healthy nutrition is an important part of leading a healthy lifestyle. Combined with physical activity, your diet can assist you to reach and maintain a healthy weight, reduce your risk of chronic diseases (like heart disease and cancer), and promote your overall health. Patients undergoing cancer treatment may need a particular diet in order to maintain their stamina. For example, high-calorie foods may need to be consumed to maintain energy. Getting enough protein and calories in the diet can potentially help with long-term survival. DASH (Dietary approaches to stop hypertension) diet include lots of whole grains, fruits, vegetables and low-fat dairy products. Genetics play an interesting role in body composition, particularly when it comes to body fat. The human body is designed to store fat in particular places, depending on gender, age, and of course, your family genes. Genes will determine women will carry this body fat around the hips and thighs as opposed to storing fat in the upper body. Men, tend to carry fat in the abdomen but can also carry fat in other places; the storage of fat, regardless of gender, can play a significant role in influencing well-being risks. Food chemistry deals with the study of chemical processes and interactions of all biological and non-biological components of food & nourishment. The biological component incorporates milk, meat, poultry, lettuce, beer etc. It is also similar to biochemistry for its main components such as protein, carbohydrates, lipids & also includes areas such as minerals, water, vitamins, enzymes, food additives, flavors, and colors. Food packaging is the packaging of food. A package is for protection, tampering resistance & distinctive physical, chemical & biological needs. It may include a nutrition facts label and other ingredient information about food or beverages being offered for sale. Nutritional Immunology is a field of scientific study that endeavours to understand how diet and nutrition influence the human immune system and its responses. For decades, people have known that the better they eat, the healthier they are. The science of Nutritional Immunology considers individual foods on a molecular level, and how they affect human health on a cellular level. Food processing is the transformation of agricultural products into nourishing food or one form of food into another form. Food products change under certain food processing techniques and ways either to improve or to prevent them from happening. Food processing operations includes many methods that are used to add value to the raw food materials which can be consumed by human beings or animals. An example of improving a process would be to encourage fermentation of dairy products with microorganisms that convert lactose to lactic acid. An example of inhibiting a process would be stopping the browning on the surface of freshly cut apples using lemon juice or other acidulated water. Food technology is a sub-discipline of food science that deals with the production, Preservation & processes that make foods. Biotechnology is any technique which utilizes living organisms to make products, to improve plants or animals, or to develop microbes for specific uses. This definition covers the traditional procedures of animal husbandry, plant breeding, and fermentation. Food toxicology is the study of the nature, properties, effects, and detection of poisonous or toxic substances in food. Radioactive particles, heavy metal elements, or the packing substances used in food processing are examples of such substances. Although you might know that eating certain foods can increase your heart disease risk, it's often difficult to change your eating habits. Because you have years of unhealthy eating habits under your belt or you simply wanted to fine-tune your diet, here are eight heart-healthy diet tips. Once you know which foods to eat a greater amount and which foods to limit, you'll be on your way toward a heart-healthy diet. Food Microbiology is a branch of Food Science to study of the pathogens that inhibit, contaminating food and microorganisms that may cause disease especially if food is inappropriately cooked or stored, those used to produce fermented beverages & foods such as cheese, yogurt, bread, beer, and wine, and those with other useful roles such as producing probiotics. Fermentation is one of the techniques to preserve food and enhance its quality. The fermented food product is less affable to other harmful microorganisms, including spoilage-causing microorganisms & pathogens thus extending the food's shelf-life. Food Adulteration refers to the process by which the quality or the nature of a given food is reduced through expansion of adulterants or removal of vital substance. Food adulterants belong to the foreign and usually inferior chemical substance present in food that causes harm or is unwanted in the food. Adulteration is a term which implies that a food product fails to meet the legal standards. An example of adulteration is an addition of other substance to a food item in order to increase the quantity of the food item in raw form to prepared form, which may lead to the loss of actual quality of food item. Dietetics is the branch of knowledge concerned about the diet and its effects on health. A dietitian alters their patient's nutrition based upon their health & medical condition and individual needs. Dietitians have directed healthcare professionals licensed to assess, diagnose, and treat nutritional problems. Infectious diseases account for more than 54% of the total majority in developing countries, where immunizations are the most effective means of anticipation. To create an edible vaccine, the information necessary to produce an antigenic protein must be introduced into the plant of interest by genetic engineering techniques. Once an individual consumes an edible vaccine, the outer wall of plant cells protects the antigens from degradation by gastric secretion, allowing the antigens to be delivered to the intestinal mucosal surface, where they are absorbed by different mechanisms in order to stimulate a strong and specific immune response. The risk factors for fatal diseases, like type 2 diabetes and hypertension, are increasingly seen in younger ages, often a result of unhealthy eating habits and increased weight gain. Dietary habits built up in childhood regularly convey into adulthood, so teaching children how to eat healthy at a young age will help them stay healthy throughout their life. Nourished food is one of the simplest and most effective ways to prevent or manage the symptoms of diabetes. However, by making smart decisions, it is workable for those with diabetes to enjoy their favorite junk foods from time to time. Recycling of food and organic waste is an innovative idea that can produce both economic and environmental savings. This naturally productive, budget-friendly, environmentally friendly disposal from Waste Management can benefit your company, your community, and the environment. Molecular gastronomy is a sub-discipline of food science that looks to investigate & explore the physical and chemical transformations of ingredients that occur in cooking. Approximately 300 additional calories are needed daily to maintain a healthy pregnancy. These calories should come from a proper diet of protein, fruits, vegetables, and whole grains, with sweets and fats, kept to a minimum. Eating a healthy diet during pregnancy is linked to good fatal brain development, a healthy birth weight, and it reduces the risk of many birth defects. Good nutrition is thought to help balance mood swings and it may improve work and delivery as well. The truth about nourishment is always in motion. Previously coffee was a carcinogen, the next it’s an effective antioxidant. Carbs used to be harmful, now (the right kinds of carbs) are the staple of a well-balanced diet. Food has been a huge part of this technological takeover, with lots of inventions being created for both industry and home uses. A portion of these inventions is incredibly fun and cool to upgrade your own love of food at home. For home gardening, shopping, cooking these are some of the coolest inventions aiming to make your food experiences convenient, high-tech, and personal. The oncology dieticians provide expert nutrition counselling services to patients and their caregivers as an integral part of cancer care. Our aim is to improve overall nourishment, promote healthy eating habits and enhance overall well-being and quality of life. Eating the right kinds of foods before, during, and after cancer treatment can enable the patient to feel better and stay stronger. A healthy diet incorporates eating and drinking enough of the foods and liquids that have important nutrients (vitamins, minerals, protein, carbohydrates, fat, and water) the body needs. Pediatric nourishment is the maintenance of a particular well-balanced diet consisting of the essential nutrients and the sufficient caloric intake necessary to promote growth and sustain the physiological requirements at the various stages of a child's development. Quality control is a branch of quality management focused on fulfilling quality requirements. Over the preceding ten to fifteen years, sales in the worldwide nutrients and supplements market places have visible an amazing spike. This has recommended more than a few of new gamers to step into the market with merchandise that ability to be the tincture of adolescents, health, and energy. The Asia-Pacific market for clinical nutrition was estimated at USD 8.87 billion in 2018 and is projected to reach USD 13.07 billion by 2021, growing at a CAGR of 8.06 %. According to the estimates of the Nutrition Business Journal report, the global nutrition and supplements market raised at US$96 billion as of 2013. A year later, it turned into nearly US$104 billion global. Going forward, the market is anticipated to reveal a CAGR between 6% and seven%. This charge of increase can be similar to that of advanced marketplace along with the US while growing markets along with Asia-Pacific will exhibit an uptick in boom charges. Sport vitamins can be designed to provide specialised support for athletes. Some of those encompass excessive-protein merchandise, together with amino acid dietary supplements, whilst additional products contain vitamins that help metabolism, power, and athletic overall performance and recuperation. People undertaking excessive athletic pastime can also have elevated requirements for water-soluble vitamins, antioxidants, and sure minerals, together with chromium. Sports drinks have blends of electrolytes (salts) that the body drops at some point of exertion and sweating, as well as nutrients, minerals, and overall performance-assisting herbs. Technavio’s studies analyst calculates the fitness supplement market in Malaysia to upward thrust at a CAGR of 8% throughout the projection length. Throughout the last ten to fifteen years, deals in the worldwide Nutrition supplements market have seen a phenomenal spike. This has empowered various new players to venture into the business sector with items that guarantee to be the remedy for youth, wellbeing, and essentialness. As indicated by the appraisals of the Nutrition Business Journal report, the worldwide Nutrition and supplements market remained at US$96 billion starting 2012. After a year, it was around US$104 billion all inclusive. The global nutrition supplements market size was valued at USD 133.1 billion in 2016 and is expected to accelerate at a CAGR of 9.6% from 2016 to 2024. This impact is due to the rising awareness towards weight management among working professionals because of extensive brand campaigns by nutritional product manufacturers. Nutritional supplements are majorly consumed with an intention to enhance the intake of essential nutritional elements in the human body. Increased cardiovascular disorders among the populations because of fluctuating diet patterns and inactive lifestyle among the age-group of 30-40 are expected to promote the importance of nutraceuticals. Nearly half of all deaths in children under 5 are related to malnutrition, translating into the loss of about 3 million children per year. Malnutrition puts children at higher risk of dying from common infections, increases the frequency and severity of such infections, and delays recovery. The interaction between under nutrition and infectious diseases can create a potentially lethal cycle of worsening illness and declining nutritional status. Poor nutrition in the first 1,000 days of a child’s life can lead to stunted growth, which in turn is associated with impaired cognitive ability and reduced performance in school and work. We are still to achieve a world without malnutrition. 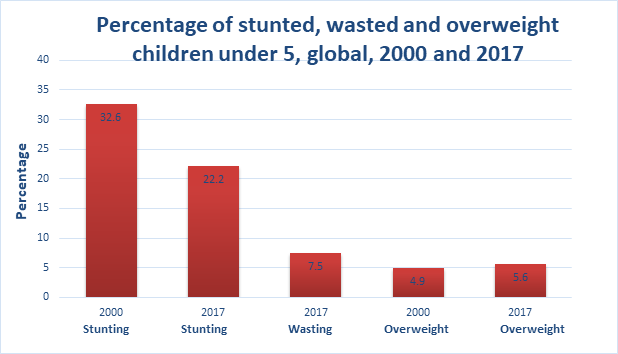 The joint malnutrition (2018 edition) estimates show that stunting prevalence has been declining since the year 2000, nearly one in four. 151 million children under the age of 5 were stunted in 2017, and 51 million children suffered from wasting. Meanwhile, the number of overweight children in the world has remained constant for more than a decade. Measures of child Malnutrition are used to track development progress. In the Post-2015 Development Era, estimates of child malnutrition will help to determine whether the world is on a track to achieve the Sustainable Development Goals – particularly to “end hunger, achieve food safety and improved health, and promote sustainable agriculture”. Dieticians, Nutritionists, Clinical nutritionists, Probiotics researchers, Nutrigenetics and Nutrigenomics researchers, Public Health Professionals, scholars and students working in the field of Clinical Nutrition, Food Science and Public Health. From Industrial sector, delegates and physicians are expected to attend the event. This is the finest opportunity to interact with participants from the Food Science associations, Food Biotechnology Associations, Food Microbiology Societies, and Food Science Academicians. It mainly concerns on the modern impact and technologies in Food Science & Technology and other relevant to Food & Nutritional Sciences, as well as for initiation of new assessments and technologies and the effectiveness of various regulatory programs on Food Science & Technology2019 conducts presentations, share knowledge, meet with present potential and eminent scientists, and receive name recognition at this two days event. Our aim is to aggregate community and to create a platform for exchange of information on technological developments, new scientific innovations and the effectiveness of various regulatory programs towards food Science & Food 2019. It provides a premier technical forum for expressing and knowledge about the advanced research and developments, as well as exploration of new applications, technologies and to explore new trends in the field of food Science & Technology. Food Science & Technology Conference in 2019 in Tokyo, Japan organize Food Meetings in the fields related to it like Food Microbiology, Food Sampling and Nutritional Science, Food Science, Food Technology.